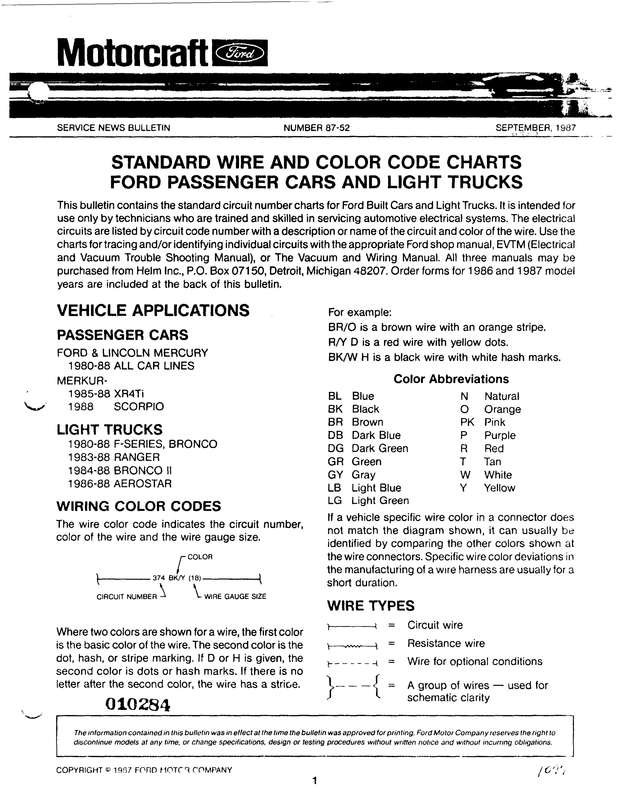 The following is a Ford publication that shows the wire colors used for each circuit as well as the circuit numbers for them. But, note that this document covers a wide range of years and vehicles, so your vehicle might not have all of the circuits shown. IMPORTANT: For the 1986 model year Ford eliminated hash marks and dots on the wires, but this documents continues to show dots and hashes. A good example of this is Circuit 36, which is the alternator's output wire. It is shown on Page 12 of the 1981 EVTM as being a yellow wire with white dots. But, since they did away with dots in 1986, on Page 15 the 1986 EVTM shows it as a yellow wire with white stripes. And yet, the document below was published in September of 1987 and continues to show Circuit 36 as yellow/white dot. So just convert dots or hash marks in your mind to stripes and you should be ok.
And, I offer the document in three forms. First is the PDF embedded here which you can peruse but cannot search. Second is the file that I've OCR'd, and you can download it and search for the circuit number, color, or load. Last is a picture of each of the pages. Happy circuit hunting!